For today's(November 15 2018) Falcon 9 launch, at around T+ 06:04 into the mission, we can see a cube shaped object flying near to Falcon 9 first stage. 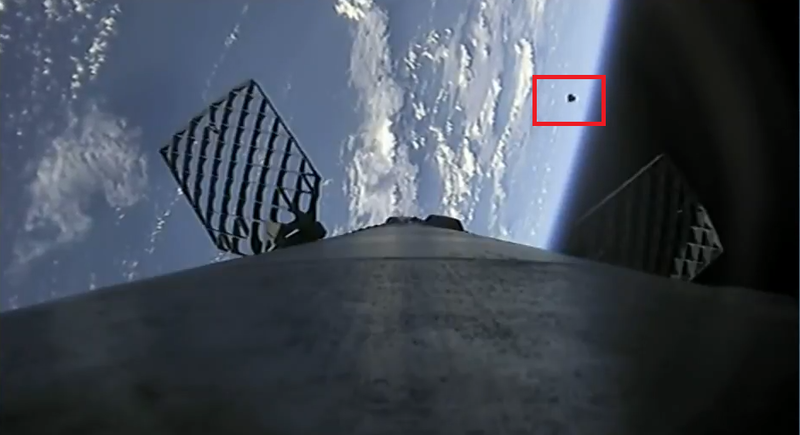 This happens just before the first stage reentry. What this object? The object seems to be in very stable flight. It's ice. Why? Occam's Razor. At the altitudes the Falcon 9 first stage peaks within there's very little else you would see - there's too much atmosphere to orbit so debris drop rapidly. There's too little atmosphere for any known fauna, and the only man made vehicles that can operate there are things like a launch vehicle - they won't turn up unexpectedly. Any objects that separated at other times from the vehicle - fairings, for instance - differ too wildly in drag coefficient to remain in proximity with the first stage for more than a few minutes. The only remaining source of physical objects in the stage's vicinity becomes the stage itself. Since it landed OK and there were no signs of trouble, we can guess it isn't a part of the vehicle. Since the vehicle stores and pumps and vents large quantities of liquid oxygen, we know for certain it will have many deposits of ice, both water ice collecting on outer surfaces as well as solid oxygen forming at vents as decompression rapidly chills the vent output. The cameras are located near the top of the booster. There is ~40 meters of vehicle below the cameras, lots of room to shed ice out of sight of the camera. As the vehicle falls towards Earth these pieces of ice break free and tumble outward. Their large, thin shape lets them catch the air and slow more rapidly and they come into sight of the camera as they move outward and upward. Tumbling can present many cross sections to the camera, producing unusual shapes. To the comments doubting the existence of ice at apoapsis - the vehicle clearly remains partly covered in ice throughout the entire mission, as the LOX tankage remains clean of soot after the mission. If all the ice shook free by apoapsis, the retrograde propulsion at the reentry burn as well as the brief exposure to stage two thrust post-staging would deposit kerosene soot on the stage, to be revealed after the ice melts at landing. This image in the hangar indicates the LOX tank remains clean even after presumably melting/drying on land and being transferred to the hangar. Not the answer you're looking for? Browse other questions tagged spacex falcon-9 or ask your own question. What is this debris on the CRS-10 reentry at T6:30? When the CRS-6 Falcon 9 first stage hit the ASDS, did the Flight Termination System explode due to the heat of the fire? What is the new horizontal test stand at SpaceX's McGregor, TX facility meant to test? 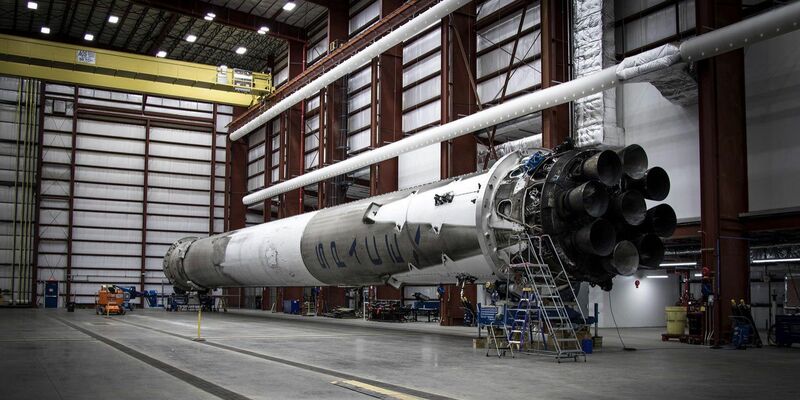 Where is the other half (stage two) of the SpaceX Falcon 9 rocket?